The completion of the master will prepare the student for a leadership role in various renewable energy and marine sectors. Students will be able to carry out high-level technical jobs in engineering companies, equipment manufacturers and other marine industries. 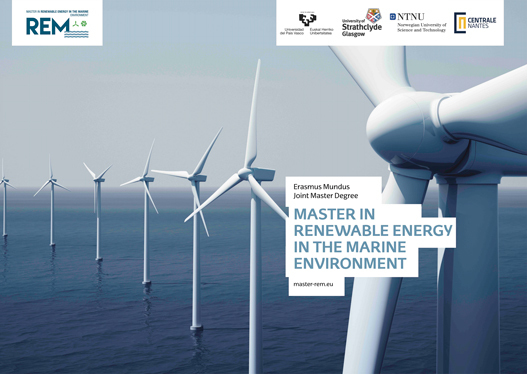 Marine and renewable energy companies and institutions increasingly demand specifically trained professionals with an advanced specific knowledge in various scientific and technological fields. This programme trains the student to face the technological challenges that harsh conditions offshore require. Likewise, students will also be able to pursue research positions in Universities, Research and Development in technological poles, and other institutes. Moreover, this programme has a network of associated centres formed by several world-renowned research institutions and companies entailing a great career opportunity for students. Not only they have a direct participation in the master teaching and hosting students for their master thesis but they also recognise that the learning outcomes of the REM programme are suitable for positions in their institutions/companies.